We are in an attention economy. There is a fixed amount of time in every day to which we can devote our attention. There are also an increasing number of entities vying for that attention: people, tasks, emails, notifications, apps, etc. If both your employee advocacy program, and the platform through which you deliver it, is going to be attention worthy, it must provide something of value to the employee. In this guide, you’ll learn how to refine your internal and external communication so that you’re supplying your employees with meaningful communications and valuable content they can share as advocates. Why is curating content important? It’s important to first differentiate content aggregation and content curation, as they are not one in the same. Content aggregation is essentially collecting information based on select keywords and storing it in a single place, whereas content curation is about leveraging resources to find the most relevant content and presenting it to your audience in a meaningful way. In a world where interest in employee advocacy has grown by 191% since 2013, content curation might just be your ticket to a richer social media strategy. Before you add an article, video or infographic to your content pool, ask yourself if you’re curating content that’s truly meaningful to your audience, or if you’re just filling a gap. While 30% of marketers say that it’s harder to find quality information today than ever before, if you can find the pieces that strike and resonate with your employees, you’re more likely to create an authentic and engaging advocacy program. By encouraging employees to participate in your employee advocacy practices, they’ll naturally start to develop their personal brand. This is critical, especially in today’s selling landscape, because people naturally trust those with established influence in their industry. Rather than just giving employees a running list of content to choose from when they want to engage on social media, why not let them choose the articles they want to share themselves? Encourage employees to suggest stories within your employee advocacy platform and include them in your strategy—it will empower those who want to contribute to the curation process and promote a collaborative program. Leveraging your team as contributors to your content curation strategy will naturally create a more diverse flow of shareable items as well as cultivate positivity among employees about your company, in turn leading to a more engaged workforce that’s less likely to turnover. Employees are some of the most underrated and untapped assets for a business. When you curate content with your employees in mind, you’ll foster engagement and entice participation in your advocacy program. You might be thinking, what do you mean by “value to the employee?” The goal of our employee advocacy program is to deliver value to the company. You’d be right to think this way, but for your program to be successful, it will rely heavily on its ability to engage your employees. What would it take for an employee to proactively devote a segment of their attention span to reading and sharing content in your employee advocacy platform? The answer to both questions lies in the experience you create through curating relevant content into your employee advocacy platform for your employees to read and share. Brand content from your website, blog, and other owned media keeps employees abreast of developments and news. They’ll feel more connected to your company through knowledge and more confident to talk about it with their networks. Job listings demonstrate that there is opportunity for growth and empower employees to take advantage of any referral incentives your company offers. Events show your company’s commitment to its community, learning and market position (in the cases where team members are speaking at trade shows). Recognition of new hires, promotions, earned media, guest blogging, and team profiles reinforces your company’s commitment to the growth of its employees, and instills a sense of pride in the accomplishments of the company as a whole. Industry articles provide opportunities for personal development (without the hassle of searching the web) and personal brand building, when your employees’ networks see them as a trusted resource for sharing quality information. In the list above, you saw how much opportunity there is for content variety to create a rich experience within your employee advocacy program. In addition, we recommend layering in content channels from external sources to your advocacy platform. That last bullet point is gold because when you create a sense of anticipation to use the platform, you’ve not only created a highly engaged user who finds real value in the platform, you’ve also created an advocate for your employee advocacy program itself. How much external content is enough? Based on internal assessments of Bambu customers who see high levels of success with their employee advocacy programs, external (or “Industry”) content accounts for approximately 45% of the overall content curated into Bambu for their employees to read and share. The story doesn’t end there. As you can see from the chart below, successful employee advocacy programs know to curate not just a healthy variety of content types (industry, job postings, events, etc. ), but also to source them from places other than company-owned assets. Since it’s smack-dab in the middle of the chart and we haven’t talked about it yet, the “Other” content type largely represents internal communications and sales enablement resource–hence the concentration in the “Internal” channel. We’ve seen this healthy mix of content types and content channels lead to increased engagement within the employee advocacy platform in not only shares, but also shares to multiple networks. Employees who are sharing to multiple social networks are truly embracing the idea of advocacy. They find enough value in the content being curated to place the highest form of endorsement on it in not one, but two and sometimes three of their personal profiles. Read on to learn more about how to optimize your internal company communications, including emails and newsletters. Digital communication in the workplace used to be owned by one channel–email. Your inbox was the gatekeeper to everything, from announcements about homemade cookies in the break room, to this week’s press mentions, to an updated pitch deck and more. Enter the multitude of messaging and communication platforms we have today, and I’m willing to bet you have, on more than one occasion, asked yourself where that updated deck was, or maybe missed out on those homemade cookies. Combine “out of sight, out of mind” with the typical poor user experience and design associated with such tools, and you create an environment that employees will only visit as a last resort. Instead, use an advocacy platform like Bambu, which combines the attention-getting and actionable nature of email with the centralization of administering a Wiki or message board? Emails have context around the information being shared. The platform has a rich, mobile-friendly reading experience. Read on to learn more about how to send internal communications effectively through Bambu. Step 1: Create an Internal Story within Bambu for the information you wish to communicate. Step 2: Broadcast the Internal Story to your team with a contextual message that either introduces the information or explains what’s been updated. Repeat as information is updated within Internal Stories or as new stories are added. Your employees will enjoy consolidated access within Bambu to all forms of company news and industry information. When you make your advocacy platform a central hub for important content, your employees also have more motivation to make a habit of regularly visiting and engaging with digest and broadcast emails. How do you know if internal stories in Bambu are the right fit for your internal communications? Here’s a self-test: if you send informational emails to yourself and BCC a large number of people, then internal stories are a perfect candidate. Tip: Close the loop. For post-event content like a blog post recap of Volunteer Day, you’ll curate that into Bambu as a story for your employees to share. But go one step further: “close the loop” by editing your internal story about Volunteer Day to include the URL of the curated blog post in Bambu. This way, if an employee looked at the internal story after the event, they could easily navigate to the content you’d like them to share. Tip: Unlike the tip from above, you don’t need to “close the loop” after publishing your product or press releases. Simply remove the “first look” internal story. Tip: Consider having a repository outside Bambu–like a network drive–for the most current sales enablement documents. Put a link to that network drive in every internal story that announces a new sales enablement document. Now that you know what types of emails you can curate as broadcasts in Bambu, learn how to get the most out of your regular internal & external newsletters. According to experts, we’ll be sending an average of 246 billion emails a day by the time we reach 2020—enough to overwhelm even the best of multitaskers. Your employees don’t have the time required to sift through all of this extra clutter in their inbox, which is part of the reason why companies are turning to streamlined technologies and collaboration tools to reduce the noise. However, don’t count out the value of the traditional company newsletter. Effective teams need a way to stay connected to the most relevant, and important information in their business. The corporate newsletter is just one element of a stronger internal communication strategy. When used correctly, it builds a stronger, more engaged community of employees. Failure to implement the internal newsletter properly could result in extra noise and more unopened messages in your employees’ inboxes. Research from the McKinsey Global Institute indicates that productivity in the workforce improves by around 25% in organizations that have highly connected employees. McKinsey also notes that a 25% higher productivity level could equate to increased revenues as significant as $1.3 trillion per year. It’s obvious that internal communications are critical to the success of any venture. The trouble is, the previous “one-size-fits-all” strategies are no longer enough to get the job done—70% of employees in a Survata study said that they crave better communications at work. There’s no doubt that this number will continue to grow as the workforce becomes more dispersed and mobile. Today, your in-office teams work alongside global colleagues, remote workers and contractors from dozens of digital avenues. It’s no wonder the corporate newsletter is so important—it helps to bring all of these teams together with one hub of useful information. The right employee newsletter examples work because they give your staff access to critical information in a simple and easy-to-access format. So, how do you design a newsletter that speaks to your employees? Great communication might be an essential component of a successful workforce, but it’s not easy to implement. The corporate newsletter is regularly overlooked or ignored by the average employee. After all, your employees are busy doing what it is they were hired to do, so if your newsletter wants to earn the attention it deserves, it better be compelling. Let’s take a look at a series of steps and informative company newsletter examples that you can use to enhance your communication strategy. If you do need to maintain a corporate newsletter in your organization, then you’ll need to make sure that your team is getting as much out of that newsletter as possible. For instance, you can give your teams a choice on how they’d prefer to access the content available, which reduces the risk of unsatisfied or under-informed employees. Though it’s easy to get caught up following the best practices of the latest company newsletter examples, remember to speak to your team. The best way to find out what your employees need from your communication strategy is to ask them how they’d prefer to receive and consume the information that’s most relevant to them. While some may prefer a monthly email rounding up the most important announcements, others may need more frequent communication. General Assembly Boston uses a weekly newsletter with a minimal design to provide consistent information to their teams without causing information overload. It’s all about striking the right balance for your company. A productive employee is an informed employee. When you want your workforce to understand and embrace your company culture, it’s tempting to supply them with as much information as possible. News that showcases your business values, insights into your brand growth and everything in between seems like useful information at first glance. However, overload your team with too much too fast, and you increase the chance that they’ll simply ignore your newsletters. With that in mind, carefully consider the kind of information your employees will need access to at the end of each week or month. Remember, the information you share should be concise and relevant to the team receiving it. Let your employees click on buttons to get to the information most relevant to them, instead of pouring it all into one email. Add visuals to keep the information engaging. Diversify the way you share data, and make sure that it’s easy for any employee to understand the benefits of your corporate newsletter. Notice how Quora highlights the “top stories for you” this week in their newsletter. They address the needs of their users instantly and provide them with links to information so that they can pick and choose the content they want to read. Where possible, try adding social media buttons into your email newsletters, so your employees can share relevant updates with their friends, family, and social networks. This could help to launch a fantastic employee advocacy strategy for your business. Ask your staff to share information that they’ve learned from your corporate newsletter on social media. Request that employees contribute to a study that you’re conducting or fill out a questionnaire that helps you measure engagement or performance. Encourage people to sign up for a new training session or company initiative. Though it’s tempting to try and get as much action out of every email as possible, stick to one CTA per corporate newsletter. Emails with a single call-to-action increase clicks by around 371%. One important thing to remember when you’re designing your call-to-action buttons and content is that you need it to be as interesting and engaging as possible. Just because you’re not writing for your target audience doesn’t mean you can resort back to boring “Click here” links. Take a look at this InVision newsletter for instance. The email features everything from the best content published by the business throughout the week, to their favorite curated blogs. Instead of a dry CTA like “click here,” they’ve used a more interesting and customized CTA on their button. Using the same strategies for enticing call-to-action copy, you can direct employees towards your intranet strategy, help them participate in referral programs and more. It’s all about prompting your people to take that next step. You wouldn’t send a consumer email out with a boring subject line, so why would you do the same thing with your corporate newsletters? Though there’s a greater sense that employees are “expected” to read the information that you send them, they won’t bother clicking on your content if they’re not intrigued by it. After all, they’ll simply assume that they can find the information they need elsewhere. Draw attention to the most exciting stories in the newsletter (segment this according to each of the teams you’re connecting with). Use the word “You” to address the benefit that the newsletter brings to your employee. Highlight statistics or other quantitative data that your employees might be interested in. Take a look through the last 6 months of business newsletter examples you have in your outbox. As you read them, do you notice a theme for using too much corporate jargon in your text? IABC suggests that 21% of communicators in the business environment struggle to keep their email language jargon-free. Make sure that the emails you write are scannable and easy to consume. That means adding bullet points, blurbs, pictures, and plenty of white space. In fact, simply treat your email as you would a blog or marketing message. When is the best time to send the newsletter? If you want to set your newsletter up for the best chance of actually being read and absorbed by employees, stick to the beginning of the day, between Tuesday and Thursday. How do you want your team to act? Are you encouraging them to take part in social selling, or do you simply want them to respond to a recent update in the business? Consider elements like the layout of your newsletter, the readability of the font or typeface chosen, the relevance of any photos or charts and whether or not the information is truly as concise as possible. How compelling is the subject line? Just like a consumer email, you still need your employees to click on your newsletter if you want them to read what you have to say. A great subject line can go a long way. One of the biggest mistakes that companies make with their corporate newsletter is assuming that they don’t need to work as hard at communicating with their team, as they do when they reach out to their customers. Remember, we’re living in a world of analysis paralysis, where your employees are constantly overwhelmed and exhausted by the amount of data that’s available to them. If you want your workforce to be as productive, efficient, and cost-effective as possible, then you don’t want to contribute to their existing feelings of information fatigue. Think of your employee as another customer. Give them the same immersive and in-depth newsletter experiences as you would if you were trying to convince them to buy or refer another customer. Allowing them to vote on their favorite new stories, provide feedback on the newsletters they receive or request less of certain types of information. Giving them access to advocacy opportunities through social sharing buttons and pre-curated content that they can access in their email newsletter. Inviting them to take part in regular reviews of the corporate newsletter strategy, so that their email experience gets a little better month after month. Including stories about your staff, or try letting your employees take over your email newsletter one day and share their favorite stories. A corporate newsletter doesn’t have to be a mode of one-way communication. Turn your emails into a conversation and discover the benefits it can bring. The age of email isn’t over yet. For internal communication to be effective, the corporate newsletter remains a powerful way to keep your people motivated and informed. However, just like any other engagement strategy, it’s important to make sure that you’re getting your message right if you want your content to resonate. For any form of email communication—both internal and external—the goal is to engage. In fact, the only difference between an internal newsletter campaign and an external one is the audience your message is tailored for. The goal behind that message, on the other hand, should remain relatively the same. Just as you would for any customer-facing email, you’ll need to develop a strategy that drives clicks, encourages employees to act and increases brand loyalty. Now that you’ve learned how to update your approach to internal emails & newsletters, read on to find out how to create winning press releases that your employee advocates will be motivated to share. The explosive growth of digital media gives people a lot of control over how they consume content. Many marketers and advertisers have shifted their public relations strategy to an inbound one that provides relevant content to prospective clients, customers and influencers at the right time and place. One of the most effective parts of this approach is a great press release. Press releases continue to be a tried and true method of reaching your target demographic with the message you want them to see. They are also a cost-effective way of generating earned media and new leads. To have your company’s news stand out from the crowd, perfect your approach to a press release that gets attention from reporters and brand audiences. In the following article, we will go over some key tips to follow when creating your press release as well as provide a press release template for you to use when writing your own. We will also touch on different ways to release and distribute your press release for maximum visibility among your target audience. A press release is an official announcement written by a company which is sent out to the media, news outlets and other sources. They are brief and to the point, filling one sole page that gets right to the point with accurate and relevant information. Some exceed two pages, but it’s recommended to keep your update concise to drive better results. Either way, make sure you provide enough information for the media outlets that receive it to develop an accurate story about your company. Stick to the facts. Don’t overstate your company’s accomplishments or throw in content to make your story more appealing to your distributors. Remember your press release will be public for your prospects and current customers to see. You should think of your press release as an important piece of valuable marketing content. To let your distribution sources know about whatever you are promoting with the hope that they will pass it along. To inform the media about your company with the hope that a reporter will pick up your story and write an actual article about it. To promote your business’ image on the internet and beyond via social media, blogs, websites and printed media. After you’ve got the topic of your press release ready, you may wonder where to start. Using a press release template helps give your writing the consistency needed to guarantee that all the essential elements are included. Your company or brand logo should be the first thing you place at the top of your press release. Most press releases have it at the top center of the page, but if you are using a distribution service like PRNewswire, it will be located at the top left of the page. This is the most important part of the entire press release. Coming up with a strong headline will better your chances of pulling in journalists seeking good stories. Make your headline engaging, but accurate. The first paragraph is the second-most important piece of a press release. Reporters are busy people, which is why it’s necessary to get right to the point in the first paragraph. Always assume they will only read the first sentence and scan the rest. Get the message of your press release out quickly and address every important point in the first few sentences. The section should include the who, what, where, why and how of whatever it is you’re writing about. Leave the fluffy colorful narrative behind. You have limited space to make your point, so be sure to support the significance of your product, service or announcement with hard numbers. Your argument will become much more compelling if you quantify it with numbers. Additionally, you’ll give reporters and other journalists more valuable information and therefore more reason to share your content. Including a great quote from a stakeholder in the company or someone close to the event gives a human element to the press release. Reporters can also use these quotes to provide context around your announcement. Your last paragraph should give useful details that complete the introductory story you made in the headline and first paragraph. Add things like how your company developed the product or service, and why you’re announcing the event. A common oversight is with contact information. A press release without a number or email is useless to reporters who want to follow up with you. Whether it’s you or someone else at the company, be sure to include a main point of contact. Things you should include are a name, email address and phone number and the information should be located at the top of the page. Do your research ahead of time and figure out what press and media you should target. This helps you tailor your story or headline. Focus on a couple journalists that cover your industry and reach out to them with personalized messages via email. By sending your press release to journalists a day or two before it is supposed to go live, you allow them time to craft their own story around your headline. An extremely necessary tip to follow is use quality distribution services. Cheaper is not better when it comes to the distribution of your press release. Your distribution is going to cost you money, so be prepared. Some of the best distribution sites we have come across are PRNewswire, Berkshire Hathaway’s Business Wire, PRWeb and Marketwire. However, there are services more expensive than others. Additionally, certain services charge more to add photos, videos and social media signals. It’s critical to figure out which fits into your budget and works best for you. When you distribute your release, you have the option to set targeting on the content. Correctly targeting your content could mean the difference between thousands of views or little-to-none. By researching what industry your company or products apply to, you put yourself in a position to have your press release read by exponentially more people. If you are using a distribution services like the ones mentioned above, try to avoid publishing on the hour. The reason for this is most companies schedule their releases to be published on the hour, which means there is more noise for your press release to compete with. By using a distinct time, like 2:12 p.m. or 8:34 a.m., you give your press release a better chance to have higher viewership. Whenever you publish a press release, it’s imperative that you cross-promote it on any digital real estate that you own. This could be your company’s blog or social media profiles. Just because your press release was published a day or two ago, you should still promote it through your digital channels to get secondary and tertiary views. Use an advocacy platform like Bambu by Sprout Social to distribute your press release template to others in the office so that they might use it for any newsworthy items coming out of their own departments. 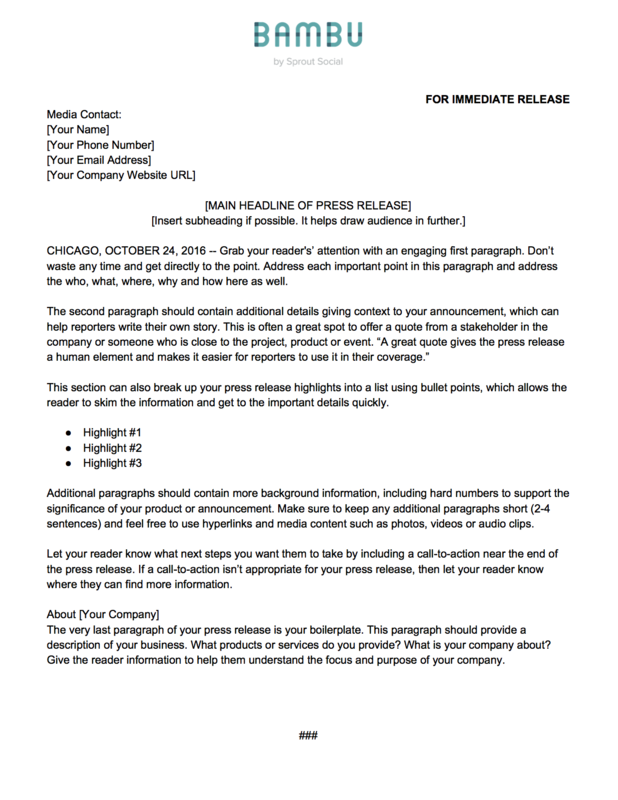 A good press release template can help benefit your company and has the potential to increase brand exposure, drive web traffic and boost sales. Be realistic with your expectations. Most reporters and journalists are swamped with press releases, so it may take a few attempts to land press coverage for your business. Feel free to use our template created below by saving the image or editing the press release on Google Docs. In this guide, you’ve learned how to boost your employee advocates by improving both your internal and external channels of communication. The people within the four walls of your business have 10x the connectivity of your brand alone, and curating content to capitalize on this reach is imperative. Encouraging employees to act as an extension of your brand has the power to launch the reach of your message.